After finally getting and using Rhino, I have created a video showing how water moves through the site where I will propose a shelter for the Landscape Observatory. I did this study to find the perfect place to collect water in the mountainside, which appears somewhat smooth in person, that would also face the location of the second observation point that is within a valley just at the bottom of the mountain. 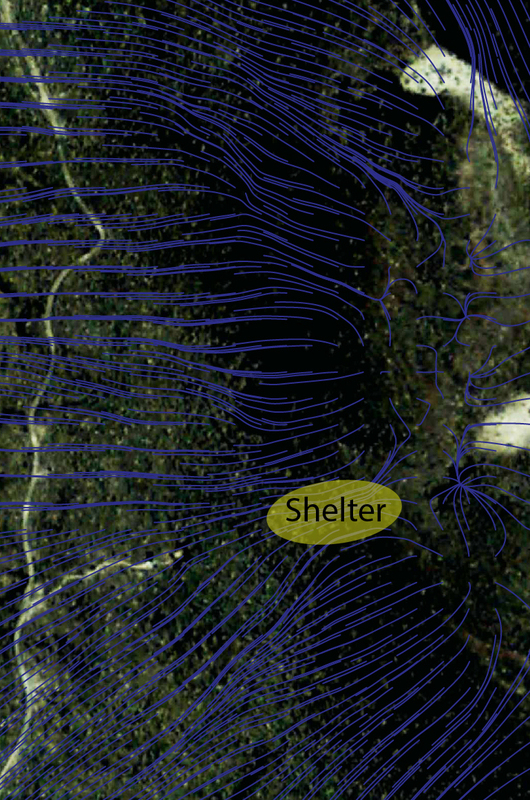 Looking at the convergence of lines that are located within a crest at the top of the mountain is the perfect spot for the shelter. By building here you collect a vast amount of water whenever it rains in the Mojave National Preserve. It also allows me to orient the shelter towards the bottom of the mountain, creating a view of the next observation point along my proposed trail. So by completing this animation and subsequent photo of the water drainage, I was able to confirm my thoughts of where to place the shelter. After creating the video and looking at where a large amount of water converged to a single point to collect rainwater, and by looking at placing the shelter in such a way to create a view of the valley below, I was able to place the shelter in the best place. This would allow me to start the observation trail in the best way possible, considering where water and views meet.